Solar Voyager: realmoh - "Red Worlds - Prox b"
realmoh - "Red Worlds - Prox b"
This is Prox b, or more precisely Proxima Centauri b, a probably earth-like planet around Proxima Centauri, the nearest known star after the sun. 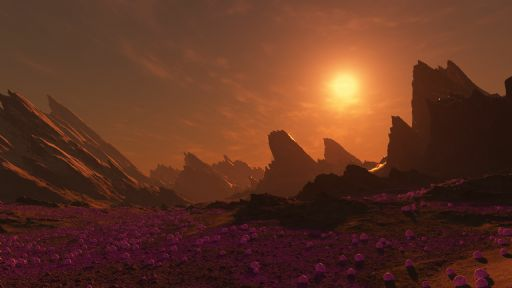 A pass in a mountainous region in the moderate but still cold parts of the tidally locked planet near the terminator: The high plain is populated by strange immobile lifeforms, neither animals nor plants. Their frisbee-like bodies seem to stuck in the soil, pointing at the always stationary sun. They are bioluminescent: For some unknown reason they are converting infrared light in visible red wavelengths and glowing in a cold reddish light. Maybe the plants glow red to get rid of excess energy. That's the reason most Earth plants are green. They can use blue light for photosynthesis, one photon per reaction. Red light also works, using two photons for one reaction. The green wavelengths don't fit either, and absorbing them cause the plant to overheat, so they're reflected. On Proxima b, red would be the high-energy photons. If a plant absorbed too much energy in the usual infrared wavelengths, being able to reradiate it as visible high-energy photons would be handy. Why they don't just reflect the excess I don't know, but there are plenty of bioluminescent lifeforms on Earth, so why on Prox-b?